The Bionaire Ultrasonic Filter-Free Tower Humidifier is quite the humidifier to consider if you are in need of an ultrasonic humidifier. It’s the perfect go-to for those of us with limited home space looking to maximize in terms of manageable size and quality! This humidifier comes with a sleek, classic design sure to mesh well with your home décor while not adding to the clutter. 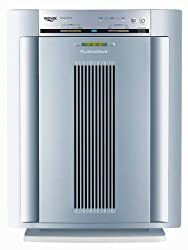 While most humidifiers require constant cleaning and maintenance, the Bionaire BUL7933CT model has minimal maintenance requirements allowing you to devote your schedule to more pressing matters. Change filter light & Antimicrobial treated. Holds up to 1.5 gallons and runs up to 48 hours per filling. The water tank is infused directly with antimicrobial protection which helps prevent bacteria growth that causes odors and stains. This humidifier says a big “NO” to contaminated air and the additional performance inhibitions bacteria growth brings in the absence of antimicrobial protection. For ease of operations, The Ultrasonic humidifier is equipped with an LCD digital humidity display, allowing you to view the current home humidity levels and program your desired humidity level accordingly. In addition to this, you can also keep an eye on the tank level, timer and other features of the machine through the digital display screen. The Bionaire Pure Quiet Visible Mist is recommended by medical practitioners, good for larger rooms, and provides protection from harmful microorganisms. The Pure Quiet Visible Mist pairs great with the programmable digital humidistat allowing you to customize your comfort and utilize the 24-hour timer. The 24-hour timer feature automatically shuts off your humidifier for extra convenience and minimal worrying. Less space required and easy cleaning. Automatic humidistat for humidity level control. Extremely quiet, allowing for a disturbance-free night. Some users are not satisfied with the water tank output, but, generally speaking, ultrasonic models of humidifiers don’t come with big tanks as seen in the heating models. Should you go with the Bioniare ultrasonic humidifier you’ll find less maintenance cost, a more affordable option, and the standard expected features. Making it one of the more popular humidifying systems you’ll find on the market.